UPDATED: Mon., Feb. 4, 2019, 8:48 p.m.
Gage Gubrud’s looming transfer to Washington State hit a major roadblock Monday, and it now seems unlikely that the former Eastern Washington quarterback will earn a sixth season of college eligibility. The Spokesman-Review learned through multiple sources the former FCS All-American and two-time Walter Payton Award finalist had his medical redshirt denied by the NCAA, which would prevent Gubrud from spending the 2019 football season in Pullman. According to sources, Gubrud will appeal the NCAA’s decision, though the timeline for an appeal is unclear. The S-R learned on Jan. 27 that Gubrud had chosen WSU as his transfer destination, pending the approval of a medical redshirt. The quarterback considered multiple schools before narrowing his search down to the Cougars and Utah. To earn a sixth year of eligibility, Gubrud needed to show the NCAA he’d missed most of, or all of, two seasons because of a medical injury or hardship. Gubrud sustained a season-ending toe injury during EWU’s Sept. 29 game at Montana State, which forced him to miss the Eagles’ final 10 games last season. A player may qualify for a redshirt if he plays in one-third or fewer of his team’s games. 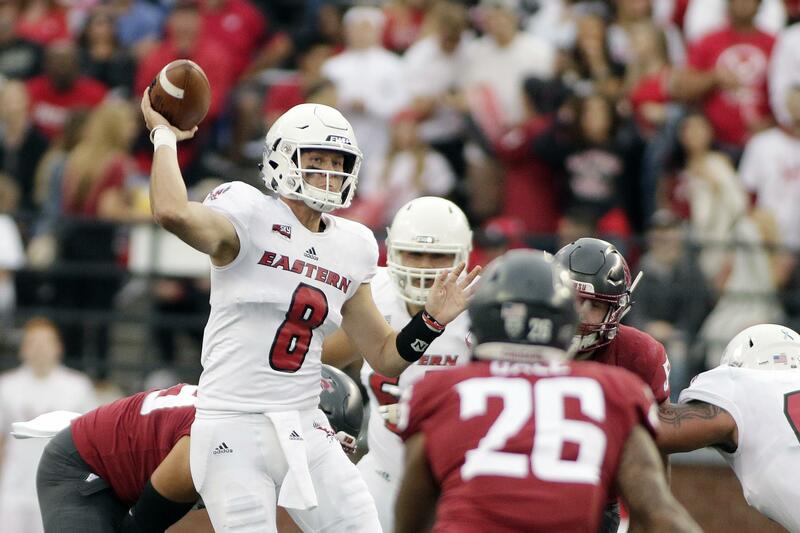 Because EWU advanced to the FCS national championship game and therefore played 15 total games, Gubrud appeared in exactly one-third of the Eagles’ games. The NCAA may have denied Gubrud a medical redshirt because the QB wasn’t able to prove he suffered another long-term injury during his career in Cheney. Gubrud redshirted in 2014 and played in three games during the 2015 season before he became EWU’s full-time starter. The QB played in 24 games over his redshirt sophomore and junior seasons before making just five appearances in 2018. If the appeal is denied, the McMinnville, Oregon, native will end his college career with 753 career completions, 9,984 passing yards and 87 passing touchdowns. One of the top dual-threat QBs at the FCS level, Gubrud also had 1,042 rushing yards and 13 TDs on the ground. Gubrud would’ve added playing experience to an unseasoned group of quarterbacks at WSU – one that loses grad transfer sensation Gardner Minshew, who led the nation in passing yards per game last season and was named the Pac-12 Offensive Player of the Year. The Cougars bring back redshirt seniors Trey Tinsley and Anthony Gordon, along with redshirt freshman Cammon Cooper. True freshman early enrollee Gunner Cruz will also compete for the starting job. The Spokesman-Review’s Ryan Collingwood also contributed to this report. Published: Feb. 4, 2019, 7:23 p.m. Updated: Feb. 4, 2019, 8:48 p.m.